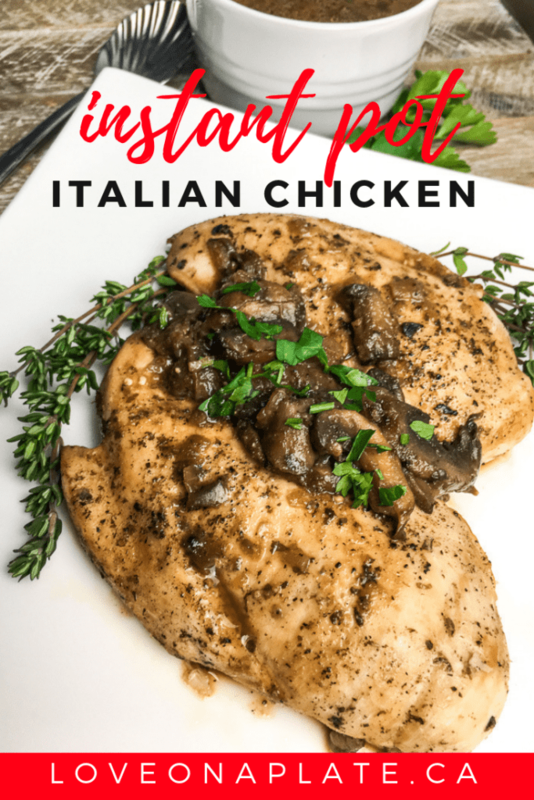 This Instant Pot Italian Chicken recipe with mushrooms, onions and goat cheese is delicious dinner. Easy enough for the weeknights, elegant enough for company, it’s also prep ahead friendly which is great for entertaining. While this says it’s Italian, you won’t find any tomato sauce. This is more like Chicken Marsala but without the wine. 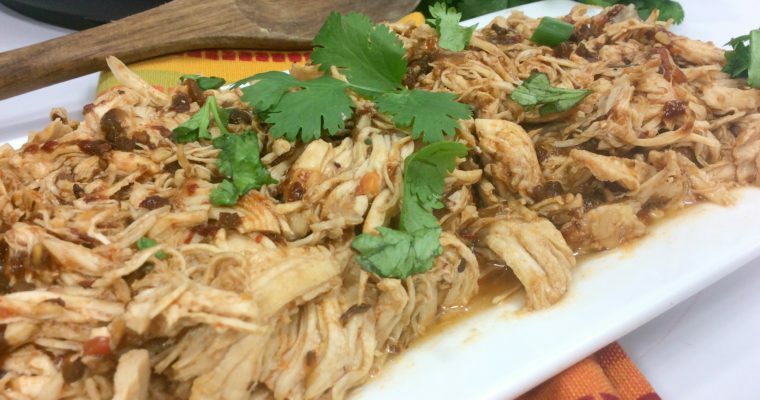 Because this is Instant Pot Italian Chicken, you end up with very little hands on cooking time, and a delicious dish that tastes like you slaved for hours. Avoid the temptation to add extra Thyme, it’s a strong herb and can over power the dish. I prefer to use fresh herbs when they are available, and have include measurements for both dried and fresh. The fresh herbs are especially nice in the summer, when you can just pick them from your garden! I love that. Serve with Parmesan Herbed Rice Pilaf and a green vegetable of your choice for a complete meal that’s ready in no time. If you really want to go all out, Ciabatta Garlic Bread with Gruyere pairs amazingly well with this dish. On the other hand, if you want to keep this meal low carb and Keto friendly, I highly recommend my Loaded Cauliflower Casserole as a side dish. It too can be prepared ahead of time and simply baked in the oven. It’s so rich and savoury no one will notice that you’re missing a starch or grain! Join us on our Facebook Group for more delicious recipes, weekly meal plans, Live Meal Prep and Quick Cook Videos and so much more! Don’t forget to Pin this recipe for later and check out our other great recipes on our Pinterest Board. If you make a recipe we would LOVE your feedback! 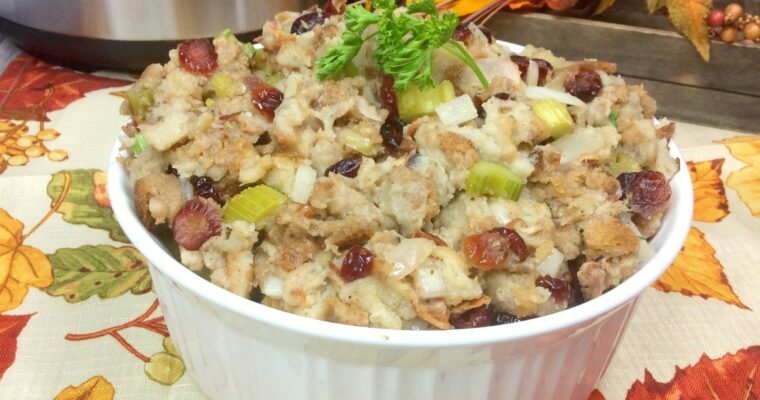 Just drop us a comment below and rate the recipe or post a photo on Instagram. #loveonaplate THANKS! 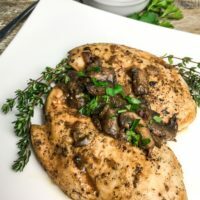 This Instant Pot Italian Chicken recipe with mushrooms onions and goat cheese is delicious dinner, easy enough for the weeknights, elegant enough for company. Add one tablespoon olive oil to Instant Pot® and select the Sauté function. Set to high and once the display reads “hot,” add red onion and Portobello mushrooms. Cook, stirring frequently, until onions soften and mushrooms start to release their liquid, approximately 5-6 minutes. Transfer veggies to a bowl and set aside. Add another tablespoon olive oil to unit. Working in batches, if necessary, add seasoned chicken to the Instant Pot® without overcrowding. Brown on both sides, approximately 2-3 minutes per side. 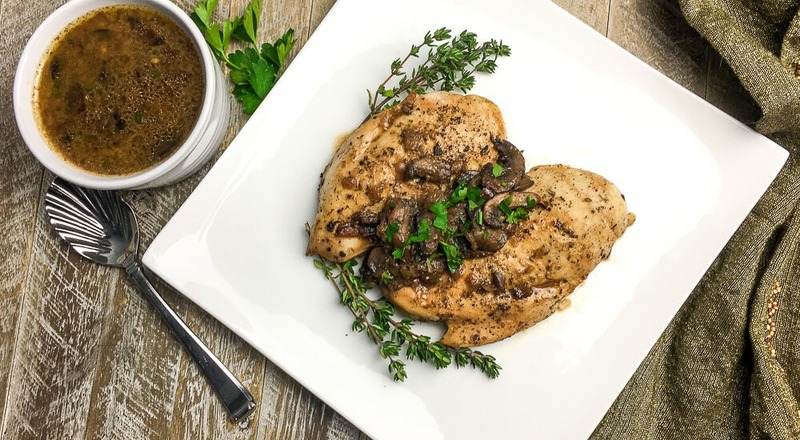 Return mushrooms and onions to Instant Pot® and add chicken broth, garlic, thyme, and rosemary. Stir to combine. Place the metal trivet that comes with the Instant Pot® into the cooking container. Place chicken breasts on top of the trivet and cover. Lock the lid and set the pressure valve to “Sealing.” Press the “Manual” button and adjust setting to “high.” Set cook time to 10 minutes.